Lightening is beautiful as it makes its way over the desert to the Phoenix and Tucson areas, but it can also be very damaging to the HVAC especially when it creates powerful surges. Lightning strikes carry tens of thousands of volts of energy and only takes a few millionths of a second to cause a serious surge through your entire home. One strike of lightning can cause crashes to computers and ruin electronics like televisions, not to mention frying anything run by the electrical panel…and that includes your air conditioning system. Homeowners can defend against most power surges. Alaskan Air Conditioning recommends a whole-house surge suppressor for huge, dangerous power spikes, and plug-in surge suppressors for smaller events. Together, both will provide the added protection needed for vulnerable electronics, appliances and home systems like heating and cooling systems. While nothing is 100% effective, this dual approach will provide your home with the most protection possible. However, if it’s too late and your home has taken a big hit, there isn’t much you can do except call a professional contractor for repairs and replacements of the home systems lost to a lightning strike or strong power surge. 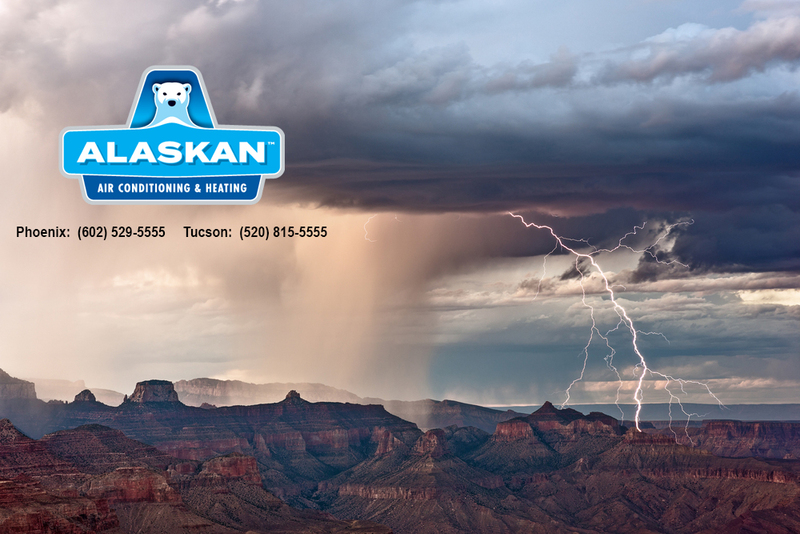 For your HVAC system in Phoenix, Tempe, Scottsdale and Tucson, Alaskan Air is that experienced contractor. We will help you! Call us at Phoenix: 602-529-5555 or Tucson: 520-815-5555 or visit us at https://www.alaskanac.com/ to schedule an appointment.